PRODUCT: #1 Master Flash Residential, Shingle / Tile Roof Pipe Flashing. #1 Size Fits 3" - 8" OD Pipes. Black EPDM Seal With 20" X 24" Soft Aluminum Base. Price/Each. DESCRIPTION: Effectively seals pipe penetrations on shingle roofs. 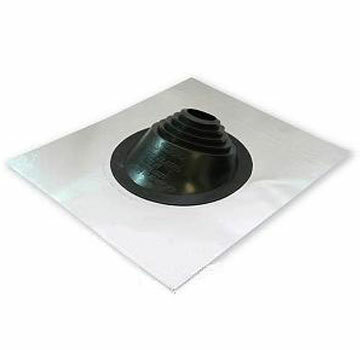 A high-grade EPDM rubber collar is molded into a nail-able aluminum base for integration into the shingle roofing system. 20 Year Manufacturers Warranty. Heavy duty black EPDM seal is ASTM C20 UV resistant and allows a 20 year service life. Fire retarded. Suitable for Class B vents .